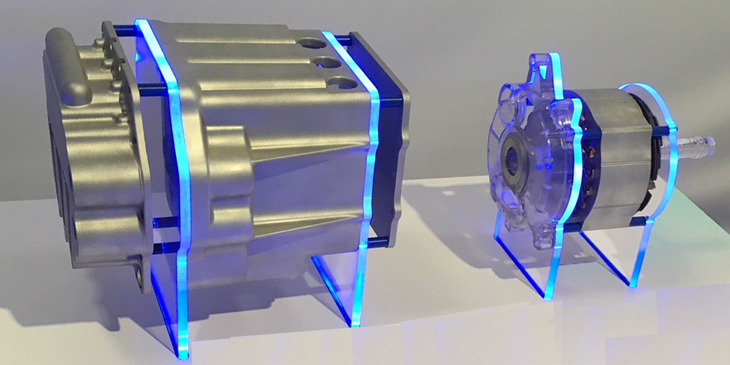 As part of its contribution to a recently completed major European research initiative to achieve more efficient and cost-effective hybrid powertrains for both passenger cars and commercial vehicles, Ricardo can today announce that it is has created a new 48V e-motor offering up to a 50 percent increase in power density compared with current production machines. The new Ricardo 48V e-motor and accompanying inverter were designed to incorporate the latest thinking in high-performance, low-cost electrification, which aims to extend the performance of 48V hybrids to offer a more attractive and affordable solution in comparison with today’s higher-voltage hybrid cars. The design and testing of this new Ricardo 48V e-motor and inverter was carried out as a part of the company’s contribution to the European COmpetitiveness in Commercial Hybrid and AutoMotive PowertrainS (ECOCHAMPS) project. Ricardo was one of 25 collaborating EU commercial and academic partners on this project, the focus of which was to achieve both a 20 percent powertrain efficiency improvement and a 20 percent reduction in weight and in volume in comparison with baseline the best-in-class full hybrid vehicles on the market at the start of the project. In doing so, the aim was for a cost premium of no more than 10 percent over equivalent conventional products – which is considerably less than the additional cost of current hybrid architectures. The ECOCHAMPS project – which was recently completed – focused on the hybridization requirements of a range of vehicles from ‘C’ and ‘B’ class passenger cars, to light delivery trucks, city buses, and long haul heavy-duty trucks. The project delivered five demonstrator vehicles – one for each of these categories – in order to demonstrate and validate the full benefits approach taken in creating low-cost hybrid powertrains. In addition to broadly achieving the targets set for all five vehicle classes, the ECOCHAMPS vehicles demonstrated their constituent technologies up to a Technology Readiness Level of 7. The new Ricardo designed e-motor and inverter combines the company’s experience gained through ECOCHAMPS and other R&D projects, as well as commercial work in developing electrified powertrain products for customers. Representing the very latest thinking in electric motor design for volume passenger car applications, the e-motor delivers a 50 percent increase in power density compared to the previous baseline design of the motor and contributes to the targeted 20 percent increase in overall powertrain fuel efficiency of the ECOCHAMPS project. Testing as part of the ECOCHAMPS project was carried out at Ricardo facilities in Cambridge and Shoreham-by-Sea on three prototype units built for the project by Ricardo. Results of this work are expected to be published and presented at the IEEE ECCE at Portland, Oregon in September 2018. This marks the start of a series of presentations being made on the results of the ECOCHAMPS project in China, Japan, USA, EU, India and the UK.